Thanks to a MA Tramway Report from Kevin Thomas, NELSAP first heard of this ski area. Operated by the Fitchburg Parks and Recreation Department, this ski area was located at the Burbank Hospital. Barry Weinstein: I am originally from Fitchburg Mass. I am 54 now but used to ski at Hospital Hill when I was a teenager. It had a rope tow, but may have graduated to a T-Bar; can't quite remember. The hill was directly in front of the Burbank Hospital with maybe a 150 ' to 200' vertical. The hill was quite steep and had no runout. It was sometimes difficult to stay out of the busy street which fronted the area. The place was always crowded in the Winter and is fondly remembered. Mark S. Bergman: Hospital Hill at Burbank Hospital was the site of many sledding and skiing injuries that resulted from an uncontrolled environment and mix of skiers and sledders (mostly the latter). I believe that the City of Fitchburg or Burbank Hospital finally closed the hill down to avoid liability. My father was Pediatric Chief at this hospital for many years. A topo map of the area. 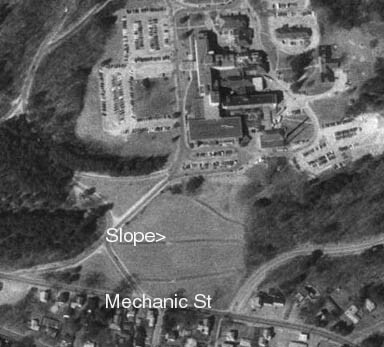 The ski slope extended ESE from the Hospital to Mechanic Street. An aerial shot of the lost area today. Not much to see other than a wide slope. Scott Walker: Don't know much but I remember seeing people ski here as a kid in the mid- late 60's. 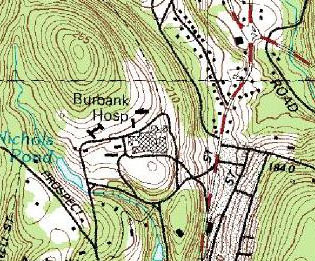 You were right, the rope tow was located on the hill on which Burbank Hospital is situated . Some interesting bits: The access roads to the hospital on this hill were very steep and located right next to the area so cars and skiers would be fairly close to one another. This was the only place I remember at the time on which skiers and sleds shared the hill which seems exceptionally dangerous now especially since the outrun at the bottom was fairly short and the road at it's base, quite busy. I'm pretty sure the tow was operated by the city of Fitchburg and I think it's use may have been free. Bill Lawrence: I grew up skiing on the Burbank Hospital Hill Rope Tow in Fitchburg , Mass. I don’t know when it closed. I believe the Hospital is called something else. It was open during the 50’s. There was a large Finnish Population back then and they would build large jumps. There where also lights for night skiing. It was literally the hill leading to the hospital right next to Pollacks store. Don Bernier: As a skier from Fitchburg (originally) I can update you a little about "The Hill". I remember it closing in the early 70's. I skied there starting in 1960. It had one rope tow and the cost was nothing. It was run by the recreation department. It was located on the Mechanic Street side of the hospital (also closed now). From Mechanic street you can see a really broken up hill with trees planted. The "bumps" and the trees were not there, but were put there to stop people from sliding and skiing. I wore out many pairs of gloves on that hill, being pulled up on my old Head metal skis with Cubco bindings. I remember skiing nights under the lights with friends. A couple of skiers who honed their skills on that hill were Ward Simonds (he actually won the race they used to have at Mt. Wachusett every year, back in the late 60's) and a deaf girl skier (Tammy M..... as I remember) who won gold medals in the deaf Olympics. D. Crawford: I grew up directly across the street (Mechanic St) from Hospital Hill in Fitchburg MA (I was born in 1960 - brother Rick in 1958). The hospital was Burbank Hospital and the hill right below it was a city run slope (no cost) with one rope tow which was lighted for night skiing. It was definitely in operation in the mid 60's and probably shut down operations in the early 70's when the hospital expanded. I'd estimate the hill had 100-150 ft of vertical. Usually, the left half of the hill was for sliding and sledding while the right half was for skiing. Ruth Smith: I learned to ski on Hospital Hill in during the 1950s. When I first skied there I had leather bindings. When people first started skiing there, there was not a rope tow and people would walk to the top. My father was the head engineer at the Hospital until 1978, I lived in the cottage on the Hospital grounds at the top of the hill.